The Town of Cobourg is partnering with Local Food For Local Good for four Courtyard Summer Series weekends that will make good use of a prime beachfront space that has not seen much programming in recent years. The fenced-off courtyard area behind the bandshell, near the Beach Hutt Canteen, will be transformed into a licensed cantina where people can enjoy local brews, cocktails and food prepared by the operators of Freakin' Reakin's and Cobourg Beach Food. Director of recreation and culture Dean Hustwick told council at Monday's meeting that there will be live music as well. Each session has a theme – Craft Brewery Nights July 13 to 15, Jazz Nights July 28 to 30, Distillery Nights Aug. 3 to 5 (coinciding with Cobourg's Sandcastle Festival), and Wine Nights Aug. 24 to 26. Hours will be 3 to 10 p.m. Fridays and Saturdays, noon to 5 p.m. Sundays. The report from community-events co-ordinator Jackie Chapman Davis broke down the roles of those involved. Lutana Inc., which operates the Beach Hutt Canteen, is responsible for food costs and sales. Local Food For Local Good is responsible for beverage sales and donations, and beverage sales will cover all event costs (excluding food costs). The town will receive a profit share as set out in its contract with Lutana. As well, the town and Local Food For Local Good will split net proceeds 50-50. The town's share will support the maintenance and improvement of the waterfront, and Local Food's share will support food-literacy workshops, community gardens and meal programs. Hustwick said the event is in line with the waterfront-study recommendation of enhancing food and beverage service along the waterfront. “We will evaluate its success and look for opportunities to improve it for next year,” he said, adding that they will also evaluate the Beach Hutt canteen at that time, as it is in its second year of a two-year contract. “I think it's a really good use of this space, and appreciate the creative and entrepreneurial group Local Food For Local Good,” Councillor Deb McCarthy stated. Council has approved the constuction of two new lifeguard stations by Sa-wat-ski Concept Realty in the amount of $24,200 (plus $370 in nonrefundable GST) at the Cobourg beach. Councillor Brian Darling explained Monday that $12,000 of this cost is to come from the 2018 parks operating budget and the remainder from the Waterfront Master Plan surplus fund. “It's something we desperately needed down there,” Mayor Gil Brocanier commented. Director of recreation and culture Dean Hustwick said they had hoped to get it done by the Canada Day weekend, “but that's starting to come really fast, so I can't commit to that. Councillor Forrest Rowden pointed out that there are four stations currently on the beach, and wondered if two were being added or whether the new ones are replacing the two that sustained flood damage last year. They are replacements, he was told, and a much more advanced model than the ones already in place. The death of 16 young members of the Humboldt Broncos Junior A hockey team struck Canadians like few other catastrophes. Because it's such an extraordinary event, Cobourg council agreed Monday to take the extraordinary step of waiving ice fees to help Northumberland H2H host a tournament to raise funds not only for the Broncos but also for the Saskatchewan Junior Hockey League Assistance Program. H2H (which stands for Hockey To Hockey) founder Mykel Steeves made the appeal to council. The April 6 collision of a semi with the team bus that resulted in the loss of so many young lives brought an immediate outpouring of both emotion and support. The GoFundMe site for the players raised more than $15-million, and the hockey stick left by the door as a symbol of support for the devastated community became (and remains) a common sight across Canada. As for himself, Steeves said, he spent two days fighting off tears and wanting to do something more to help. “Then it hit me – let's play hockey!” he said. Boston Pizza, Lauria Auto Group and other local businesses are helping out with things like photography. And he even has the support of the Humboldt mayor, who has ensured that proceeds are given directly to the team and to the affiliated assistance program. The Cobourg Community Centre ice is reserved for 8 a.m. to 9 p.m. that day, and the cost is $2,000. The CCC has already agreed to waive $500, but Steeves was hoping the town would approve a waiver of the full fee so that the team and its program can benefit even more. Deputy Mayor John Henderson agreed that the outpouring of grief was heartfelt and almost unprecedented. And while the town has a policy for situations like this, Henderson added, these are exceptional circumstances. Councillor Debra McCarthy wondered what this might say to the community, when council is singling this out as an exceptional event – as opposed to a van mowing down innocent pedestrtians in Toronto. “Do we, as a community, identify more with young hockey players?” McCarthy wondered. Former Cobourg mayor Peter Delanty attended Monday's council meeting to witness the vote to rename Coverdale Park after him. Mayor Gil Brocanier related a long list of accomplishments even apart from the retired CDCI West principal's time on council (and as mayor). He is a Rotary Club of Cobourg member who has also been active with a number of organizations, including Northumberland United Way, the Cobourg Public Library Foundation, Cobourg and District Historical Society and a number of municipal committees (most recently the Cobourg 2017 committee that celebrated the country's bicentennial with many wonderful local events). Brocanier added that Coverdale Park is near where Delanty and his wife Suzanne raised their family, and he is a long-time fixture on its tennis courts. “I was very, very proud to put this forward for council consideration,” he said. 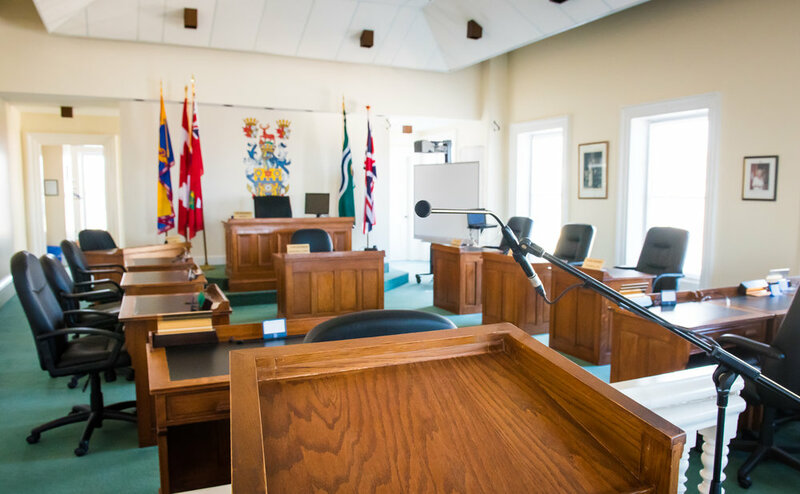 Mayor John Henderson invited Delanty to address council (and Councillor Forrest Rowden couldn't resist warning him of the time with, “Ten minutes, Peter”). “I am very, very honoured that town council and the mayor have given me this honour,” Delanty said. Delanty said he is looking forward to the unveiling ceremony, and plans to have his whole family attend. “It's very well deserved, Peter, and we will give you lots of notice for the official ceremony so you can notify your family and have them attend,” Brocanier said. Even though Doug Ford has won the premiership of Ontario with (among other promises) a pledge to reduce hydro costs by 12%, Cobourg councillors expressed a lack of optimism that this will help with the new Venture 13 roof-top solar-panel project. Council approved the project at last week's committee-of-the-whole meeting, but Ford was elected in the interim. Deputy Mayor John Henderson remained confident in the 25-year project for Venture 13, and predicted that the province must become more involved in green-energy projects. Mayor Gil Brocanier shared his conversations with an official from Bruce Hydro, who told him hydro costs will not go down and, to the contrary, must keep going up and up. Brocanier said his own calculations bear that out for this particular project, even if Ford succeeds with his 12% decrease. One reason they must decrease reliance on Ontario Hydro is its $9.3-billion debt and the interest incurred each month. “We are at such a transition time right now, and I appreciate the numbers,” Councillor Suzanne Seguin said. “I really had a hard time supporting this without knowing what the province's plans are going to be. We have heard a lot of promises, as we always do in elections, and they may or may not be kept – they probably won't,” Seguin predicted. Brocanier said the town purchases its electricity from Lakefront Utilities Inc., and they're able to keep costs to customers down because of their distribution and delivery system. Of perhaps 67 utility companies in the province, he said, Lakefront ranks among the five least expensive. Ontario Hydro, on the other hand, is the most expensive, and their distribution and delivery system has not been kept up. “Talk to anyone who lives in the rural community about the number of times they have power outages,” he said. “Our company is doing a great job,” Deputy Mayor John Henderson stated. Councillor Debra McCarthy said they should not lose sight of the fact that the rooftop installation will offset one-third of the facility's electricity costs and earn carbon credits. Councillors who attended last week's fundraising launch for the West Northumberland Hospice Care Centre – now known as Ed's House after the project's single biggest donor – were amazed at how close it already is to its goal. “I would like to thank the Lorenz family for their significant contribution,” Deputy Mayor John Henderson said at Monday's council meeting, acknowledging the $1.5-million given by Ed and Diane Lorenz. He also singled out the Read-Elliott family for their $1-million gift. “I am quite glad they did get a large amount to start with, and I offered to do a fundraiser Oct. 20,” Councillor Forrest Rowden announced. Meanwhile, Henderson said, now is the time to donate. “I do hope every citizen can give a little bit,” Councillor Brian Darling stated. “We have a fabulous community - the amount of money that has been raised for palliative care is an important part of a humane society,” Councillor Suzanne Seguin said.